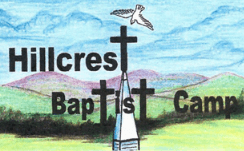 The vision, mission, and commitment of Hillcrest Baptist Camp Assembly, Inc. (HBC) is to reach the lost, disciple the saved, and make discipleers of the disciples. Hillcrest is holy ground dedicaed to the Lord and kingdom advancement through individuals, churches, associations, etc. of the Heartland of America. Therefore, HBC seeks to meet the needs of youth, adults, families, churches, associations, Baptist Men, Woman’s Missionary Unions, Sunday Schools, Christian Colleges and their teams, Baptist Student Unions, Fellowship of Christian Athletes, and other Christians needing HBC facilities and ministries. The hope and prayer of HBC and cooperating partners is that working cooperatively and collaboratively we can do more together than working separately to fulfill the “Great Commandment”, the “Great Commission” and the teachings of our Lord and Savior, Jesus Christ. Therefore, HBC purposes to become all things to all peoples that we might by all means save some (1 Corinthians 9:22). The Vision of the Camp is to fulfill the heavenly vision of the Lord. The mission of the Camp is to be obedient to the “Great Commandment”, the “Great Commission” and all the teachings of the Lord Jesus Christ contained in His Holy Word through the leadership of the Holy Spirit. The Mission of the camp is religious, educational, and charitable.